Christine Valters Paintner is an author and Abbess of AbbeyoftheArts.com where she combines expressive arts, spirituality and contemplation in a virtual monastery focused on compassionate soul care. I discovered her from a friend I met at a creativity retreat. Christine had me at “virtual monastery” and her Monk Manifesto! What’s not to love?! I immediately resonated with her approach and love what she has created, especially being someone who needs regular silence and healthy amounts of solitude. Offerings include books authored by Christine, an online community, self-study and facilitated online classes as well as in-person retreats in the United States and in Europe. I love how she describes how she integrates and honors her creative rhythm and contemplative practices into her business life. I am a huge fangirl of AbbeyoftheArts.com! What is your background and how did your experience lead you to found the Abbey? Who do you think of reaching with this work? Thanks so much Joy! It is such a delight to have folks who have been with me long-term and are committed to what the Abbey is about. Most of my work has been the result of an organic process. While I am someone who does enjoy making lists and plans, my strongest growth has come when I continue to work, but release my own agenda and pay attention to how my work is unfolding. I call it “following the thread” where I honor the things in life that bring me alive and shimmer as clues to the next step. I honor the things in life that bring me alive and shimmer as clues to the next step. My background is in academia. I went to graduate school for a Masters and doctorate in theology and Christian spirituality with every intention of teaching at a university. I did teach for Seattle University for several years as an adjunct, both undergraduate and graduate classes, and I enjoyed it. But I also found academic life stifling, too many restraints on what I could teach and how I could write. At the same time I started a blog – my first blog was called Sacred Art of Living, and I still hold to this idea that our first art form is the living of our lives. It was on my blog that I slowly tried to develop my voice away from the academic standards I had been so shaped by. I wanted my writing to reach people and mean something, not be stuffed away in a textbook that only a few people would read. I have complete respect for academics and for what they write. I have a very scholarly heart and am grateful for my academic training and the rigor involved, because I do think it made me committed to bringing spiritual resources of real depth to the world. So much of what is out there doesn’t have a solid foundation in anything. In graduate school I also discovered my love of monasticism and became a Benedictine oblate, which means I am a lay person who makes a commitment to living in a contemplative way, right in the midst of daily life as a married woman. Now my work centers largely on supporting others in becoming “monks in the world.” No longer is it necessary to go off to a monastery. My website in its current form, is a virtual monastery, so I offer support to folks in this commitment to living life differently than what the dominant culture values. What was your first offering? My first online class was called Way of the Monk, Path of the Artist, and it brought together these two loves of mine: contemplative practice and creative expression. The class filled within days and I was stunned. With online teaching I can reach a wider audience and people can participate at lower cost than traveling to learn from me. So it really opened the door for me to shift into this work full-time. 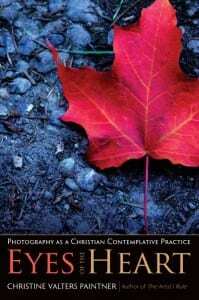 Your book, Eyes of the Heart: Photography as a Christian Contemplative Practice, and blog reflect some of the ways you stay connected with your center. What are your personal practices or rituals for working on your creative offerings? How do you decide what the next project or step is for you in your business? You offer people many paths to tie various forms of expressive arts to their spiritual and soul care work, I’m curious what specifically works for you. My fundamental practice is mindfulness and presence. I don’t believe in multitasking. Really, the way I can be so productive is giving my full attention to whatever I am doing in the moment. I have a tendency to plan many things and feel pulled in many directions, which can create anxiety. So breathing and returning to what is before me is essential. And I get far more done than when anxiety is ruling my world. I never want to market contemplative practice as a productivity strategy, but I do think that our focus on doing multiple things at once really drains our capacity for showing up fully for our work. I have a rhythm when I am working at home which definitely includes contemplative walks and photography. I find physical engagement through walking, swimming, yoga, and dancing another essential element of nourishing my work. I also have a tendency to live too much in my head, so when I feel “stuck” nothing frees me up faster than movement or being out in nature. I am very fortunate to live by the sea in Galway, Ireland, and long walks along the bay are part of my daily practice. I also have a practice called lectio divina (sacred reading) which my husband and I do together each morning. Essentially it is an ancient way of reading sacred texts (which can be scripture from any tradition or poetry) in a contemplative way. This has become such a touchstone for me, because the texts I read always have a line to offer me which can shift my thinking about things. In the practice, we listen for what shimmers and what the invitation is out of this. Much of my discernment around new projects arises from this space. I am also an avid journaler, and find journaling a place of such clarity, where I can dump everything that is going on in my chattering mind onto the page and sift through it until something emerges. Rest and retreat are also essential practices for me. I love to take naps, which also help to shift my perspective when I have been thinking too hard about something. Getting away for some silence and solitude is very grounding and important for me to reconnect with the source of all my creative ideas and tune in to what is calling to me most strongly. Really, the way I can be so productive is giving my full attention to whatever I am doing in the moment. Do you yourself complete all the exercises in your books and courses? When I teach the expressive arts, one of my fundamental principles is that folks should always experience an exercise they plan to lead with others. So I try to live by that myself as well and engage in whatever I am offering to others. It gives me valuable insight into how an exercise might be experienced and places of resistance. How does working this way feed your productivity and your business/marketing? How do you incorporate rest, or nourish yourself when you feel depleted? I have really learned from experience what depletes me and what nourishes me. I come from a very monastic approach on this and try not to invest my worth in doing and what I achieve or produce. I think of it as a service to the world, an offering of my gifts. But there are times when I need to pull back and take some time for deep rest. Humility is absolutely essential. I think of it as a service to the world, an offering of my gifts. But there are times when I need to pull back and take some time for deep rest. Humility is absolutely essential. This past year is a good example. My husband and I embarked on a great adventure last spring, selling everything we owned and moving overseas first to Vienna, Austria, and then to Galway, Ireland where we now live. Through all of our transitions and travels I have been running my business full-steam. So I have discerned that I really need time this summer off from teaching, off from deadlines and the need to produce on schedule. I need restorative time for my body to recover from the many demands I have placed on it, as well as time for dreaming and pondering of possibilities. I find open space like this really sparks my creative inspiration. After some time for just rest I will still be working, but in a more open-ended and playful way, seeing what is really calling to my heart. Thankfully we try to live fairly simply, another monastic principle, which also gives us the freedom to make choices like this and follow the rhythms that most nourish us. Where is your creative energy these days? And what is on the horizon? My heart is really being drawn to the power of pilgrimage, after having explored it on such a personal level these last several months. I have a book in the works, based on an online art retreat I led last year, about the archetype of the pilgrim in each of us. I hope to have time this summer to work further on it. This past spring I led a writing and photography pilgrimage to Vienna and I loved witnessing participants fall in love with a city I adore. My husband and I are right in the midst of making plans for a pilgrimage to the west coast of Ireland in spring 2014 to explore the many ancient monastic ruins here as inspiration for how to live as a monk in the world. AbbeyoftheArts.com: You can sign up for her 7-day ecourse on becoming a “Monk in the World” here at no cost. Monk Manifesto: You may download a PDF version, or a German one! My favorite book from Christine is The Artist’s Rule: Nurturing Your Creative Soul with Monastic Wisdom. I’ve been a fangirl of Chief Curiosity Officer Maryann Devine of Kindergarten Mind for a long time. She and I connected at a retreat (of course!) and have kept in touch over the years. She always wears arty eyeglasses, which I love. I appreciate details she reveals through her writings, like her obsession love of perfume and flents as travel essentials. She’s an unapologetic introvert, even calling for Introvert Party Amnesty! I’ve been a happy, though sometimes silent, participant in several of her programs focusing on project execution. Each one of Maryann’s thoughtful offerings are safe, gentle, playful and highly considerate of each person’s individual process. From artist to arts marketer to her latest evolution as a “personal awesome-illuminator and perspective-shifter,” it’s been a delight to witness her entrepreneurial journey unfold and blossom. Could you tell us a little bit about your background & Kindergarten Mind? Kindergarten Mind is a safe space for you to discover and connect to your creativity, and to celebrate it. If you’re drawn to the idea that every one of us is inherently creative, you can be a part of Kindergarten Mind in a number of ways, from hanging out on the blog and Facebook pages, to taking online classes (both paid and free), to coaching sessions with me that reveal your own most brilliant ideas. The path I followed there was anything but direct, though. I went from living and working as an artist to raising money and awareness for cultural organizations to creating arts marketing strategies as a consultant to teaching arts people to use social media to helping artists find an audience to helping people tap into their own creativity, strengths, and resources. It was a zig-zaggy road, but creativity has been a constant companion on the trip. What does “creative rhythm” mean to you? For me, it means tuning in and paying attention to what makes that creative energy flow, respecting those needs, and adjusting when that rhythm changes, because it always does. You seem very attuned with the creative rhythm within your business. It’s a work in progress. The recipe for creative rhythm in my business is a combination of my clients’ needs and my own capacity to meet them. And that’s always changing. Just when I think I’ve figured it out, I realize it’s shifting. So for now, I’m not planning as far into the future. I’m giving myself permission to change plans and be flexible. What other practices, routines or rituals help you enter that creative space? For me, creativity is truly a practice — I have to show up for it no matter what — and routines reinforce that for me. My mornings — creative energy peak time for me — are the same, day after day: oatmeal, yoga, meditation, sometimes Shiva Nata, journaling, and then whatever creative work I need to do for Kindergarten Mind. Is rest incorporated in the creative rhythm within your business? Rest is absolutely a part of that, maybe the only part that never changes! We underestimate how much rest we need following intense activity like creating something new. I know I do. Now I make it a point to build a lot of recovery time into my schedule, whether we’re talking about the completion of a big project, or the wrap-up of a one-hour meeting — as an introvert I know it’s crucial for me. I also pay a lot of attention to the process of entry — into phone calls, client sessions, dentist appointments — really everything — which is something I learned from Havi. Another thing I’m learning and trying to put into practice is: filling back up after all that creative energy has been expended. If I don’t let myself absorb the stuff that nourishes and inspires me — work by other artists, designers, writers, musicians–I have much less to give. How does working in this way help your marketing and productivity? When you’re trying to be productive, it’s hard to give time to the entry and recovery processes, to rest, to inspiration and play–it feels counter-intuitive. But at least for me, I do get more of the right things done when I respect that process. And I think of marketing as a creative activity, too. It requires you to think in unconventional ways as well as planning the tried-and-true. And it takes energy to execute effective marketing. Where is your creative energy these days? I feel so energized at the idea of reaching many, many people with the message that, no matter what they do in life, and no matter what anyone’s told them, they are creative, and life is richer and more rewarding when they tap into that. With that in mind, we’re making it easy for people to take that step, with a free ebook called “Sow the Seeds of Creativity,” and by keeping class prices affordable. Our next class, “A Play Date with the New Year,” prepares you to cross the threshold in your own, unique way, with comfort and ease, instead of pressure and unrealistic expectations, and it’s only $29 – $49. “Sow the Seeds of Creativity” is an affirming, gently playful and encouraging ebook about expressing our innate of creativity in a myriad of ways and how to nurture it in our daily lives. I’ve been a Play Dater for some time, even writing about the experience as part of her Society of the Secret Play Date here. Her offerings helped me get things done in the most playful, open way. And no, I won’t tell you my code name! I’m attending a business retreat this weekend with a small, electic group of entrepreneurs. We’re going deep, facing blocks and (literally) burning them. We’re challenging the ways in which we’ve run our businesses. This is tiring work for any entrepreneur, but as an introvert, one of my personal challenges is managing my energy at live events. I worried about maximizing my effectiveness. I worried about missing something important. I worried I wouldn’t meet enough people. The anticipation, adrenaline and intensity to maintain my energy would knock me back. Not surprisingly, I’d often get sick after returning home. Well, it took awhile, but I finally gave myself permission to take care of myself. Self-care, what a concept, right? Have a nice place to retreat. I prefer a quiet room close to the venue so I can easily and comfortably hide out. If my hotel room isn’t close to the venue, I scout out parks, churches, libraries, museums, bookstores and other quiet corners where I can take a break. This is easier than you think. Getting out of the event space, or “getting some fresh air” can make the difference between making it the whole time or burning out at the end of the first day. I review the schedule and see where I can create spaciousness for myself to have a quiet moment. If it’s a large conference, you have permission not to attend every minute of it. You have permission not to “work it” every second you are there. I find I’m more present at the portions I do choose to attend, and at the same time relieved I’m not expending energy on things which aren’t as valuable to me. In a more intimate setting, it’s harder to bow out of a particular session. Take advantage of breaks. If you do miss something, you can use it as a conversation starter, “Hi, I missed So-and-so’s presentation. What did you think? What did you get out of it?” Anything more sensational will generate buzz. Listen and you’ll pick it up. I’m selective about who I agree to meet and when. I do pre-conference sleuthing and find out who is attending. I’ll make initial connections via email or social media. Anyone attending live events knows at some level there won’t be enough time to meet everyone. This limitation can work for us introverts. People miss seeing each other all the time at gatherings. So, you have permission to connect with as few or as many people as you want. You have permission not to attend all social events without guilt. I let myself stay open to spontaneous gatherings, depending on who I meet. That said, I opt out and wish everyone a great time and follow up later. As much as I would like to plan and prepare, ultimately, I need to stop and check in with my personal energy barometer. Do I need a short respite? Or is it time to call it a day? How can I take care of this? Not listening to calls for rest costs me so much more later. Acknowledge what you need, whether you end up pushing through, take a few moments for yourself, or head back to your retreat.